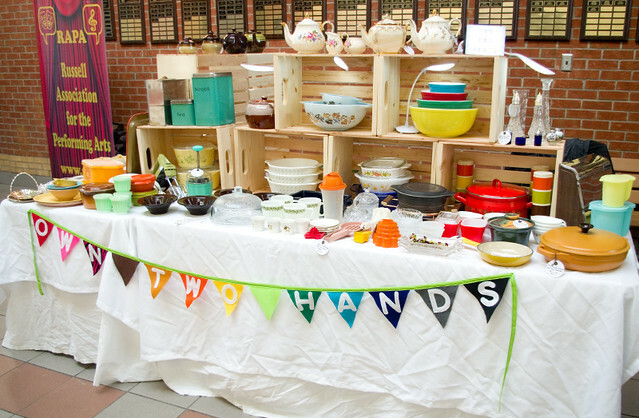 It’s my second flea market at Russell Flea this coming Saturday (9:00am to 3:00pm), and I am super excited. I think I’m starting to get the hang of this booth set-up and tear-down thing. I’m really looking forward to meeting all kinds of new people and hopefully chatting about cooking, collecting, and handicrafts. 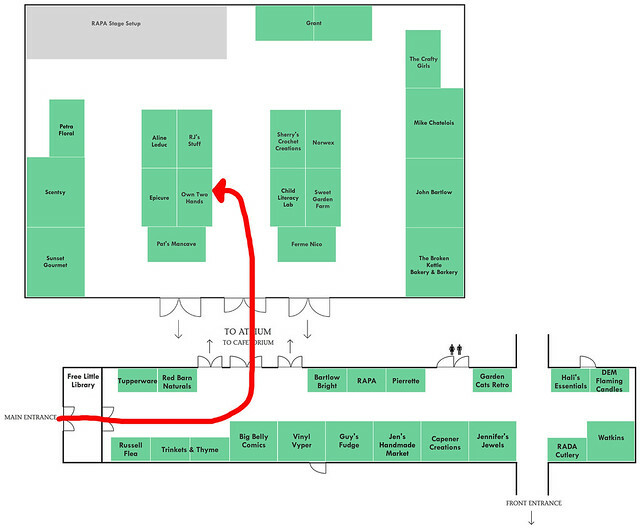 This very much not-to-scale map shows you where you should be able to find me. I combined two layouts that were done to different scales so that I could draw that red arrow. But I hope it’s clear enough. 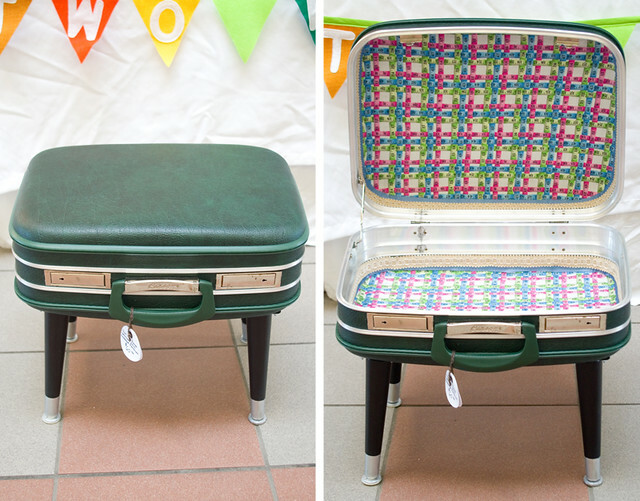 One of the items I’ll be bringing back this week is the footstool/table that I upcycled from a vintage suitcase. It hasn’t found a home yet, so this might be your chance to snap it up. I did hope to make a few more items in time for Saturday, but I’ve been experiencing technical difficulties, namely that I keep snapping drill bits. I’ll hit the hardware store tomorrow and try to pick up a stronger bit. 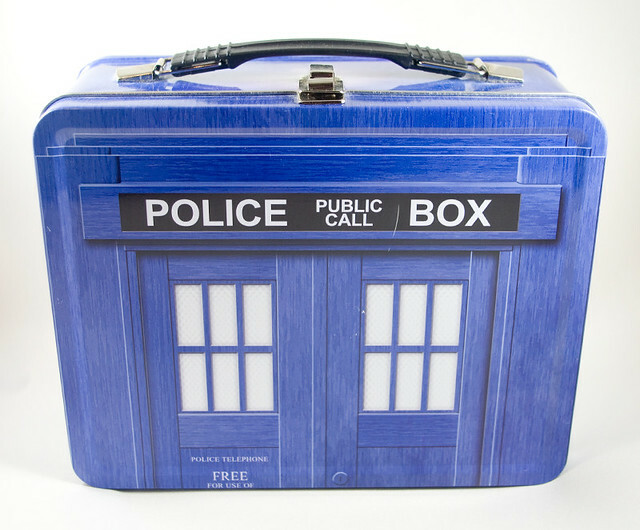 If all goes well, some all-new upcycled items (if that’s the proper term) will be ready for the weekend. I’ve also added a bunch of items to my vintage kitchenware lineup — I wish that I could keep them all, but I just don’t have the space! 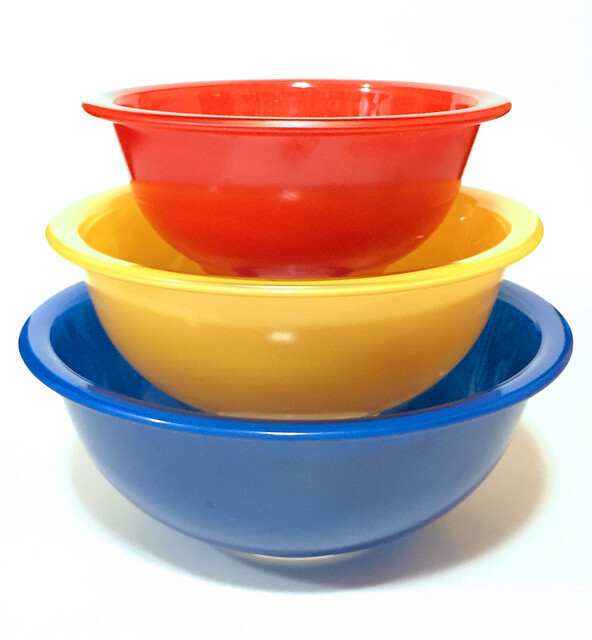 These sweet 1980’s Pyrex mixing bowls have a clear bottom. With the practicality that one expects from this brand, the colour is on the outside of the bowl, with clear glass inside so the colour shines through. This means that you can use a hand mixer or similar tool without having to worry that you’ll scratch the finish off. 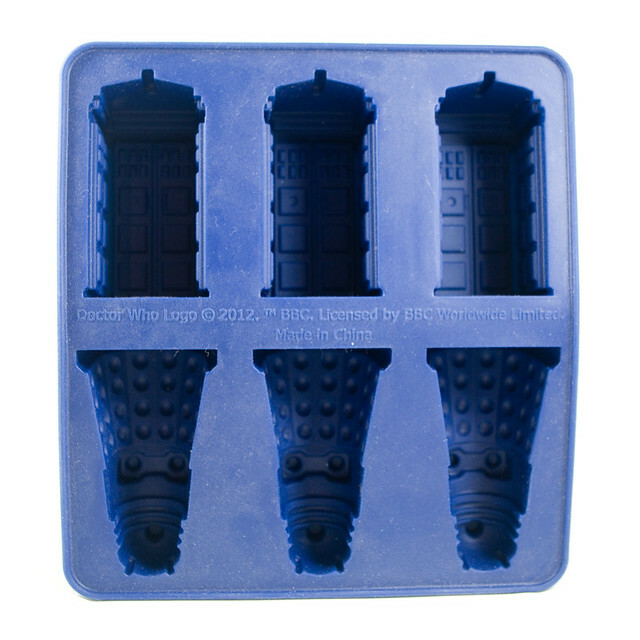 These things are definitely built to last. I found all kinds of neat things at the Great Glebe Garage Sale this past Saturday, although I did try to exercise some restraint and didn’t fill up the entire trunk. Although I did see someone walking past who had purchased a modern spinning wheel, and if I’d found it first it would totally have come home with me. Ah, well. It’s probably best for my budget. 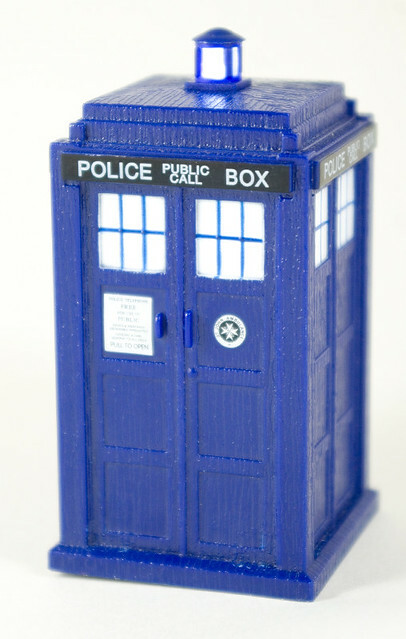 I was actually pleasantly surprised to find a number of Doctor Who merchandise, which, since it is imported, can be pretty pricey around here. 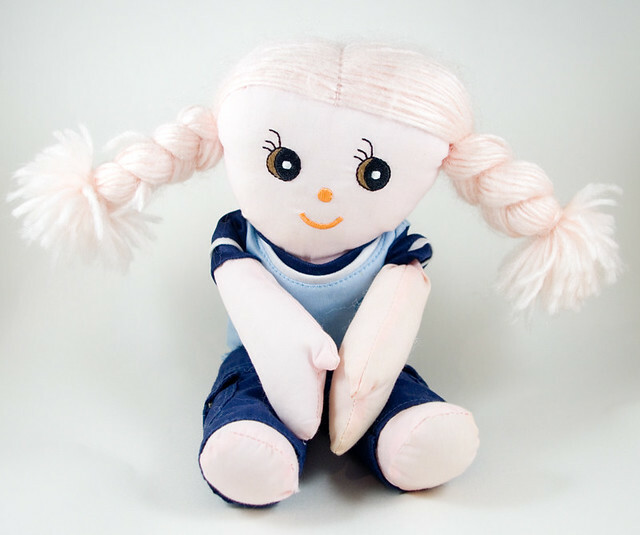 – Girl Guide doll (an older version of the ones found here), $2.00. I was especially happy to come across this doll because my girls already have dolls in Sparks and Brownie uniforms, and my eldest will be starting Guides this year. 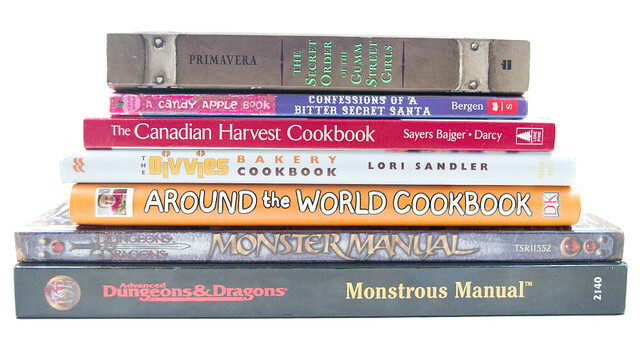 Of course, no day spent rummaging through garage sales comes without a stack of books. This was my only purchase that was too large to photograph in my light box, since the gun is almost a meter long. Please ignore the dandelions in the lawn. I didn’t test it to see if it works at the sale as it requires batteries, and I still haven’t, to be honest. I plan to use it as a costume prop, so it doesn’t really matter if it fires. 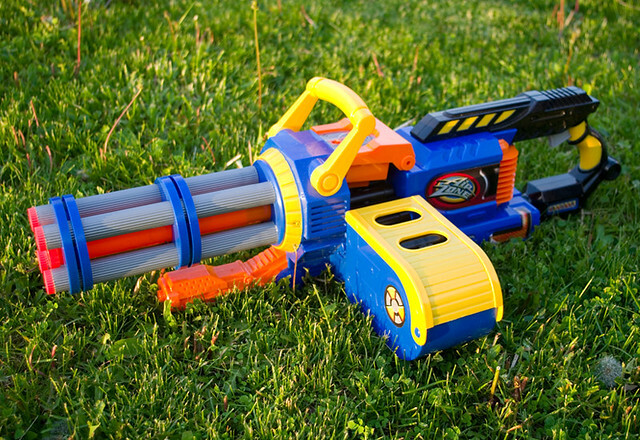 I thought it might be fun to paint it up as a junior version of Sasha, the gun the Heavy uses in Team Fortress 2. This was my most expensive purchase, but also the one I am happiest with. 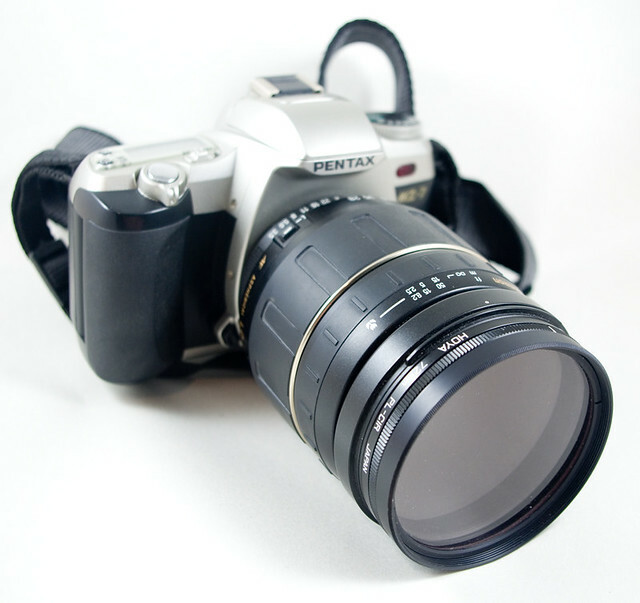 The camera itself is a side bonus; the lens works on my Pentax K-30, which is currently my main camera. My longest lens previously was 200mm, so this is a fantastic find for me. This last one is the purchase I am most happy with. I have always wanted a camera like this, not to use (can you even buy 8mm film anymore? ), but because I am a bit of an old home movie nut. 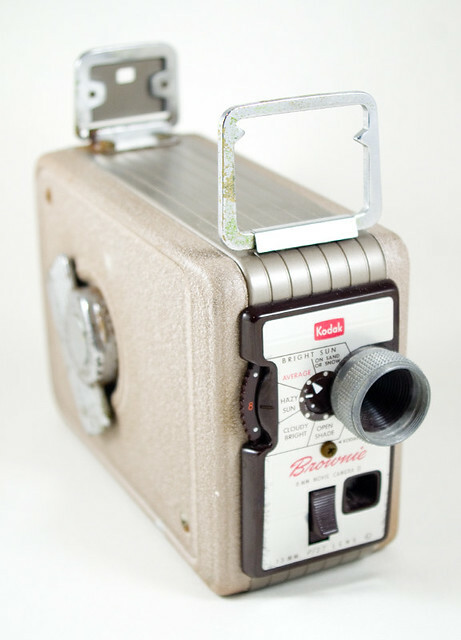 My maternal grandfather shot his home movies on a camera like this. This camera will happily be added to my collection. I think I need to build a shelf to exhibit them all. 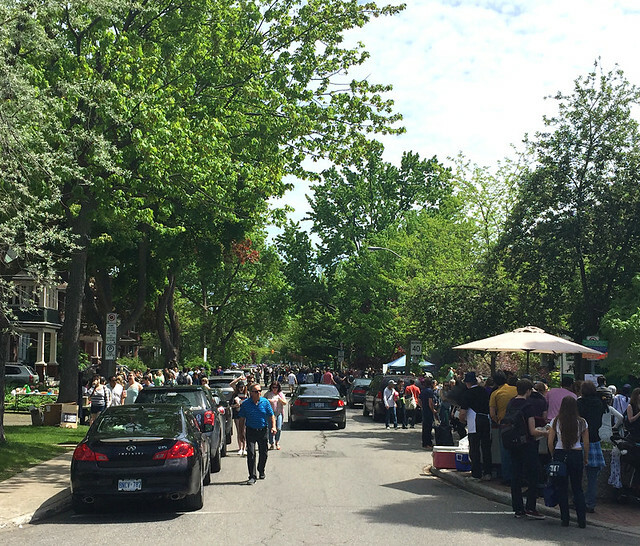 The Great Glebe Garage Sale is a Big Deal in Ottawa. 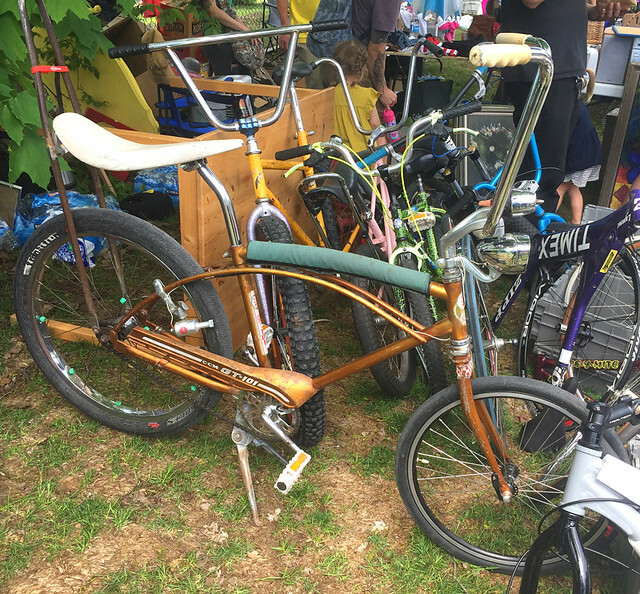 A community garage sale may not seem like an exceptional event, but it is huge and densely packed with buyers and sellers alike. The roads are thronged with people, strollers, bicycles, and parked cars. Driving in the area — which is usually a fairly quiet residential area — is inadvisable; if you’re going to park in the area, plan to show up at the crack of dawn to get a spot. Even people who don’t go to garage sales as a general rule will make a day of hitting this one. Panorama taken to give an idea of the crowds; click to enlarge. Please ignore how some people are visually chopped up, as everyone was moving and my camera objected. Taken from just north of Glebe Ave. and Lyon St. South. 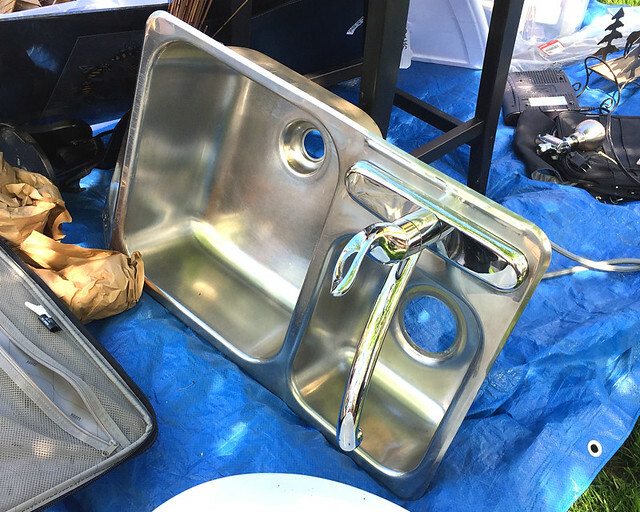 I found somebody selling everything including the kitchen sink. For those unfamiliar with the area, the Glebe is one of the older and wealthier areas of downtown Ottawa. It is bordered by the Queensway (a.k.a. the Trans-Canada Highway) to the north, the Rideau Canal to the east and south, and Bronson Avenue to the west. The residential streets are lined with huge hundred-year-old houses, and are shaded by equally-old trees. I spotted this CCM GT-101 bicycle in a hodgepodge of bikes in front of the Glebe Collegiate. I think it would have fit right in in Stranger Things — it even still had its headlamp. Except that CCM is a Canadian company, and Stranger Things is set in Indiana, I guess. Bargain hunters on Glebe Ave. The Glebe Community Association schedules and runs the Sale, which has been held on the fourth Saturday in May, rain or shine, since 1986. Sellers are expected to donate a portion the day’s proceeds to the Ottawa Food Bank. The goal for this year was to raise $12,000, which is in addition to all of the other fundraising events that take advantage of the crowds. For example, every year I have attended there has been a scout troupe selling hot dogs and cold drinks in front of St. James United Church, and they do a brisk business. Some groups pool all their resources and run a larger sale from inside a community center or church, although some such fundraisers are held in volunteers’ driveways and front yards. This was the thing that I wanted the most at the entire garage sale, but at an asking price of $175 it was much too dear for my budget, especially since I didn’t need to use it for anything, I just liked it. 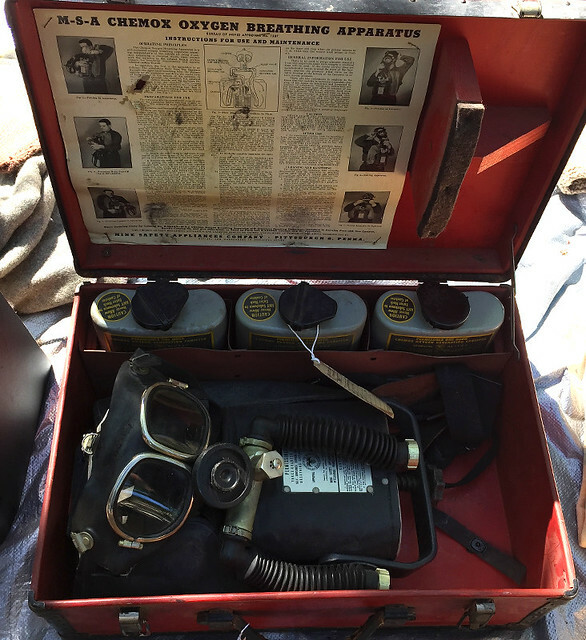 It’s an M-S-A Chemox Oxygen Breathing Apparatus — a rebreather (probably for firefighting), most likely from the 1950’s. 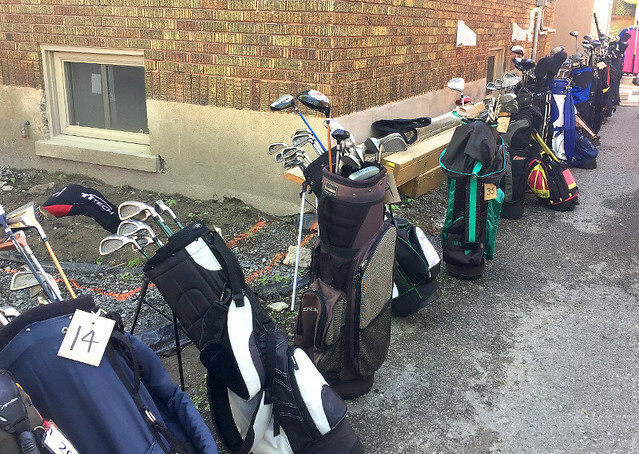 Both sides of this driveway were lined with golf bags; there were literally so many that I couldn’t get far enough away to get them all in one shot. I have been attending the Great Glebe Garage Sale for at least fifteen years now, and my success in finding things to buy has been variable. Some years I don’t find a darned thing; other years I have to walk back to my car (usually parked outside the Glebe but within relatively easy walking distance) four or five times to drop things off because my bag(s) have become too heavy. But I find it fun to go whether or not I discover any treasures. Half of the thrill is of the hunt, but there’s also a lot of fun to be had people-watching (spotted a man carrying a live parrot on his shoulder this year), listening to music (there seems to be a busker or a DJ set up on every block), and eating (every fundraiser going is selling food on the street, alongside every style of food truck in town). 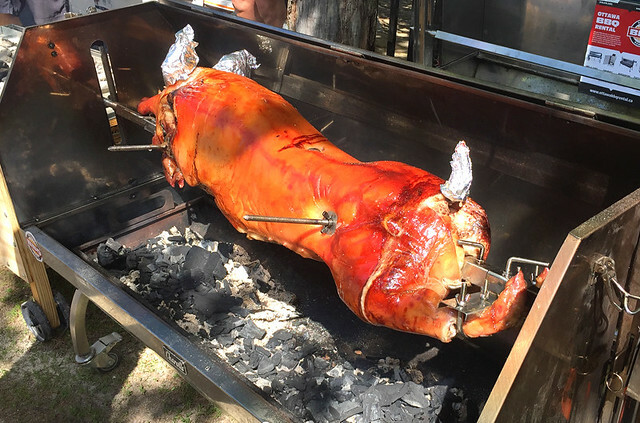 A whole pig being spit-roasted for pork sandwiches to be sold at lunch. It smelled divine. The crowds on Third Ave. 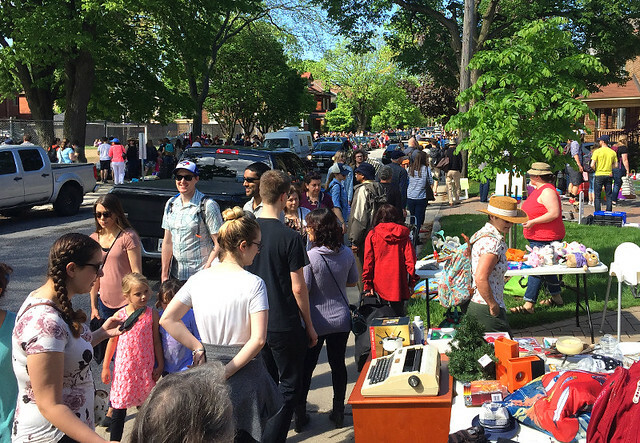 If you’ve never been to the Great Glebe Garage Sale, and you’re in town on the fourth Saturday in May, I highly recommend that you go. Especially if you’re into anything that can be difficult to find — you might just get lucky!